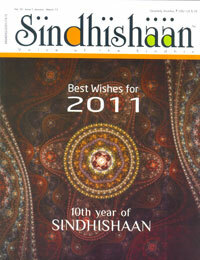 The issue of Sindhishaan you hold in your hands is Volume 10, issue 1, implying that the publication is 9 years old and now enters the age of twin digits. NINE YEARS! ! ! The realization hits one with mixed feelings – surprise at the speed of passage of time; sense of pride at what I have achieved with a twinge of remorse at what I have not. Right from its inception Sindhishaan was never meant to be a pure commercial venture but rather a labour of love, a passion, a ‘junoon’ which I could sustain, even by just breaking even or even by dipping into my finances, without hurting too much. Today, when I sit back and look at the scorecard I am pleasantly surprised. If I were to ascribe value in materialistic terms to what I have been able to give to the Sindhi community via my association with Sindhishaan and its publication, I am put to shame by the comparison with the returns. What I have received is several times greater, both in terms of value and satisfaction – enduring friendships, unstinting love and affection, respect and honour and knowledge and vision about the community, much beyond my imagination. No commercial value can be assigned to what Sindhishaan has given me in return. When I started off, I was warned about the groupism within the community and the oft repeated joke of comparing Sindhis with frogs in an open jar without the need of a lid to prevent escape because of their inherent trait of pulling the other down. Believe me when I say so, that all this depends on your own attitude and I have experienced the best of relationships with all the so called groups within the community. Of course you cannot eliminate a few square pegs from round holes but I can confidently vouch that these exist in greater numbers in other communities and it is unfortunate that only the Sindhis have been stuck with this label. On the aspect of how successful I have been in achieving the aims and objectives I set out at the launch of Sindhishaan; I can conclude with reasonable satisfaction the score sheet says “better than expected”. The movement began with a whimper, gradually gained momentum and now, to my pleasant surprise there are Sindhi groups sprouting everyday on the Internet, Facebook etc. you name it. Granted a majority will shut shop or fizzle out – but looking at the numbers, one can safely assume that Sindhyat has finally caught the fancy of the Sindhi Youth – which was my main objective and now its here to stay for good. So where does that leave Sindhishaan “Mission Accomplished” – time to move on? One has to accept that the pace of change witnessed in the last decade has been mind boggling – change is the name of the game – time to be online in real time instead of coming out with content after every 3 months!! And all that's now possible – and my friend Bharat Harwani of Win Cable has lofty plans for this, to specifically address the community needs. Maybe I too should communicate news and inspiring content in real time and revive my e-newsletter 'Prerna' to maintain my link. As is said 'better to retire when you're at your peak than be asked to leave'. I have often been asked in the past why don't you charge 'lifetime' subscription for Sindhishaan instead of 1 / 2 years and my answer has always been “I have no problem if what you mean by lifetime refers to my life or the life of the publication – but if you are referring to your life, I have a big problem – I never know how much refund to give you if I ever decided to stop publication!